Welcome to our new series: “A picture says …”, featuring interviews with displaced creatives for whom a camera is a mode of artistic expression for the sights and people they encounter in their nomadic wanderings. Overseas history: From least to most recent: Azerbaijan (Baku); Switzerland (Geneva); Kenya (Nairobi); Canada (Vancouver, British Columbia); Hungary (Budapest); France (Toulouse)—2012 to present. 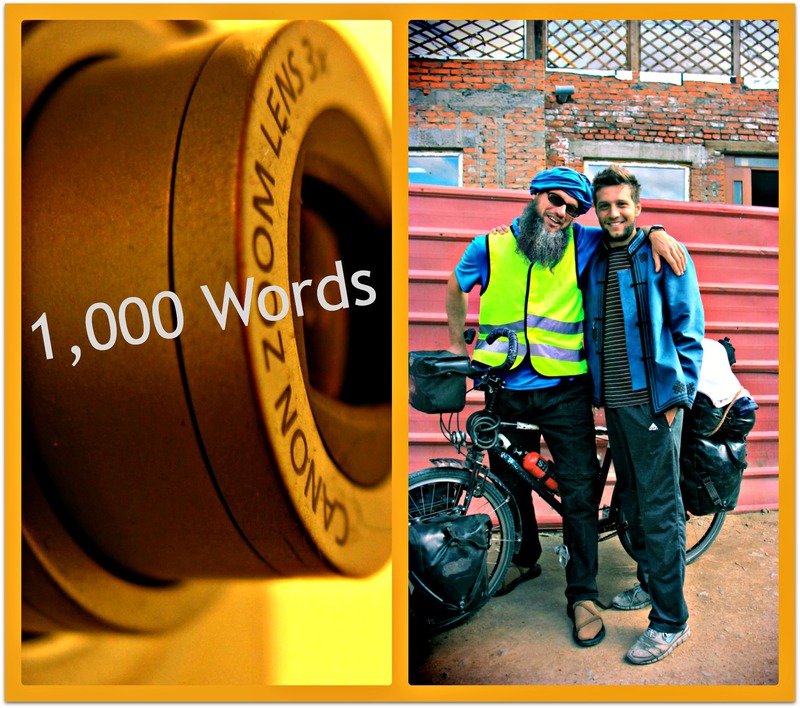 Occupations: Graduate student of economics; travel photographer; amateur snowboarder; adventurer! Without further ado, let’s find out more about Ildrim and the way he uses photography as a creative outlet for his international adventures. Hello there, Ildrim. Welcome to the Displaced Nation. Let’s begin by having you tell us a bit about your travels. What inspired you to set off and what has motivated you to keep on going? My first travel experiences come from traveling with my mom and brother. My mom is eager to change her surroundings, so thanks to her I was lucky to move around and travel early in life. At an early age I’ve been amazed at how life can be so different for people elsewhere than my hometown. I think that this early fascination developed into a strong curiosity about lifestyles. Now that my mom no longer takes me on adventures (she gets herself into trouble without me! ), I try to find my own means of traveling and satisfying my curiosity about places around the world. You are a self-described adventurer. Do you prefer going and going, or do you sometimes settle in one place for a time? As I travel more, I realize that it’s not just about seeing a new place that excites me the most. As fun as it is to keep going and going, simply being somewhere new isn’t always satisfying. Settling somewhere for a time gives me an opportunity to live through something different and possibly understand it. I understand you recently moved to Toulouse, France? Yes, I moved to Toulouse in September 2012 for graduate school. I felt like grad school would open a few doors to pursue some of my other interests, and it presented a fairly easy way to move to another country. So I set out to look for good schools around the world that fit my background as well as academic interests. At the time I was interested in southern Europe, and Toulouse offers the right kind of balance: it’s a great school with welcoming people and fine landscapes to be explored. Plus an opportunity to finally master French was very appealing—though I have to say I’m not doing a very satisfactory job so far. Photography for me isn’t just an art form, it’s a way to share experiences. When and why did you start using DSLR cameras? I got my first DSLR in 2010, shortly before moving to Budapest. I got it in order to document the move. Does the process itself of capturing a place or moment affect the relationship you have with that place? For example, does capturing a good set of photos increase the fondness you have for that place? The process of capturing a moment does affect the way I experience a place, which in turn affects my relationship with it. But how I feel about a place has a lot to do with how I feel about the people from that place. So when I spend enough time in one spot, I get to meet people and build relationships. However, when the stays are short, the camera has a more significant role as it facilitates a connection with others. It helps me get a reaction, an emotional response—a smile or maybe a conversation. But it’s important to point out that in some places around the world, carrying a camera can have a negative affect. People are fast to judge you on how you look. In Kenya, for example, I have a lighter skin tone, which results in the locals treating me differently, not necessarily in a positive way. Likewise, having a large camera around your neck or in your hand will send a different signal and will be interpreted in a different way depending on where you are in the world. I would just like to add that one way in which camera affects my experiences is that it taught me how to look at things differently without a lens. It helps me appreciate things differently and it’s important to know when to put the camera away and enjoy things with your own eyes. It’s easy for me to get sucked into continuous photo taking when I’m in a new place. Though I enjoy it, there are still other things to be enjoyed behind the lens, which is even more true when you’re traveling with someone else. But it doesn’t have to be one or the other; with time I’ve been learning how to balance the two. For me, the camera has to be an extension of the adventure and not the purpose for it. Looking back on all the places where you’ve taken photos, which have been your top three favorite places to shoot? Although my opinion changes with time, my top spot for now is Mongolia. Last year I spent about a month there. The people and their lifestyles around the country fascinate me. The landscapes are pure and surreal. When you have such a keen interest and curiosity about your subject, shooting becomes that much more enjoyable. I’m actually redesigning my Website to present more content via other channels than a blog. One of the new sections will be about my experiences in Mongolia. The other two places that I love for photography are coastal British Columbia and Croatia. Once I started using a DSLR I’ve realized that scenes that come out on my computer screen don’t reflect the whole beauty of the moment. They don’t transmit the same type of emotion I felt standing behind the lens. So I tried and am still experimenting with different techniques to bring myself and others closer to how it actually was, at least in my mind. I don’t always try to achieve the most “realistic” looking photos, but rather try to transmit the feeling of the scene. 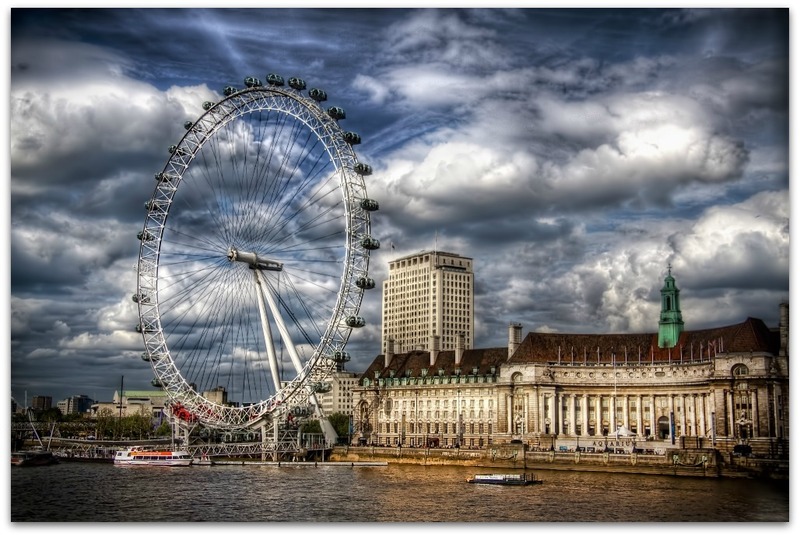 I notice that one of the techniques you’ve used is High Dynamic Range Imaging (HDR), an example of which can be seen in this striking image of my hometown London (original here)—by the way, you’ve now made me feel a little homesick! Tell me a little about HDR and how a novice photographer like myself can go about trying to achieve similar effects with a DSLR camera. I have a very basic example of what High Dynamic Range (HDR) does in one of my blog posts. In a nutshell, cameras don’t capture the range of light the same way our eyes do. Our eyes adjust to both bright and dark spots in the same scene while for cameras it’s always a trade off. HDR photography allows you to capture more light by taking multiple shots of different exposures. I take three: one normal, one overexposed bright photo, and one underexposed dark photo. By combining these three shots together you get a higher range of light information available to play with. Some people take five or even seven photos, but three is enough in most situations. The auto-bracketing option on modern-day cameras helps you take three photos with a single click. Set the camera on Aperture priority mode (“AV” or “A” on most cameras) to have the same aperture and depth of field in all three shots. Use software* to combine all three shots together and then let your imagination take charge. *Some of the most popular softwares are Photomatix Pro, HDR EFEX PRO and HDR Darkroom. Then there are options like Luminance HDR, which is free (open source) but will take some time getting used to. Whichever software you choose, it will help you combine all this light information into one image. Then it’s almost always a good idea to take it into your preferred photo editing software and continue working as you would with any other photo. Tell me about this recent photo you took of a street vendor in Kiev (original here). How did you find yourself in Kiev? I was on a long earthbound trip in 2012 from Budapest to Hong Kong, which took me through Kiev. How did you come across this street vendor? Did you converse with him before taking his photo? There was no verbal communication. Rather, I nodded at the guy while moving the camera in my hand slowly, indicating that I wanted to take his photo. His face was blank in acceptance so I went ahead and snapped the photo. Do you always try to try get permission from people when trying to take a photo? I prefer to ask for permission, but sometimes it’s the spontaneity that makes the photo and asking would yield a different result when they prepare themselves for the photo. Either way, I make sure the subject knows I’m taking their photo. Is it difficult to obtain permission when facing a language barrier? It’s important to learn how to communicate with your facial expressions and your body as well as being able to read others. In my experience, regardless of whether your communications are verbal or non-verbal, the more confident and subtle you are, the more likely you are to get approval. 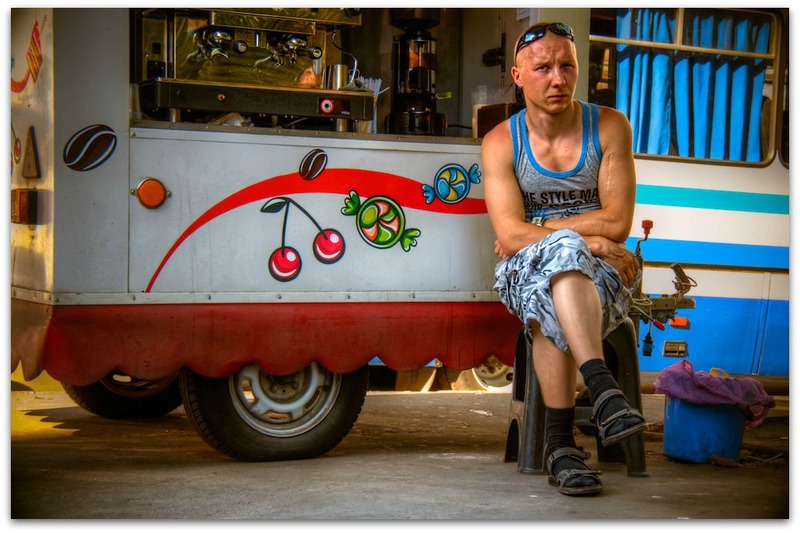 One thing about the street vendor picture that really stands out for me is the boldness of the colors. Can you tell me why and how you set up the shot like this? Initially, I tried to achieve an effect that would provoke an emotional response akin to the one I had in that moment. A new environment can be emotionally overwhelming—a feeling that can be difficult to capture. First impressions are special. So when I first started editing it was the exaggeration of colors that made me feel the closest to “re-experiencing” the place. Although you can never really re-live the moment, you can come up with something that reminds you of it. In a way it’s like when a friend tells you a “you really had to be there” story—and exaggerates the details to make the point. It’s not that the true story needs any exaggeration to be interesting, but you need to have the exaggeration to translate the feeling. Many of these aspects of photography are, of course, a matter of experience and taste. Believe it or not, my earlier photos were even more color crazy. With more experience I’m leaning away from it and trying to express the moment in other ways. I really like black-and-white photography and the subtlety of its expression. I find it trickier and am experimenting with it more at the moment. When you take a look at the two photos mentioned above, what’s the first thing you remember? The London photo reminds me of my host, a friend I haven’t seen in years. The photo of the Ukrainian street vendor reminds me of a young violinist I met on the train and spent the day with. It also reminds me of how hot the day was and my craving for kvass (a fermented drink made from rye bread). Believe me, a hot day in Ukraine can make you crave kvass as a refreshment. Are you hoping that these photos will evoke similar emotions in other viewers? The intent is not always to prompt the same reaction I had. The same photo can prompt many different reactions. I like it when visitors to my site send messages expressing how my photos reminded them of their own experiences. Finally, do you have any advice for wannabe photographers who are traveling or living abroad, on getting started? I’d say to take photos for yourself first and not to think about what others would want to see or to try to meet their expectations. The first person your photos should move is yourself. Thank you, Ildrim! Readers, what do you make of our first photographer post? Some wise words here, and who knew that autobracketing could be so useful? So, any further questions for Ildrim? Please leave them in the comments! Great post! I got into photography when I became an expat so I hope this is the first of many. Also wise advice from Ildrim – sometimes you miss the experience when you’re too focused on snapping! Thanks Aisha. It’s not always an easy advice to follow. Thankyou! And yes, I know it’s not – much to my detriment! Very Interesting. Have looked at some points from a different angle. Great photos and interesting blog.